A few year later, General Insurance of Singapore (GIA), introduce a new Motor Claims Framework (MCF) to curb the raising accident claims. The general concept is to mandate motorists to file their accident reporting within 24 hours after any accident so that insurance companies will have the earliest claims details and photos of the damages to assess the possible claim.Most importantly, under the MCF, they roll out a new initiative called “Pre-repair inspection”. All third party claimant must allows the potential defendant to appoint a surveyor to inspect the vehicle prior to repair. This technically cement the level of damages due to the claimant’s vehicle. MCF is still relevant as of this article. Today 9 insurance companies remains as members of this IDAC network. The 9 insurance companies policy holders still enjoys the benefits of having IDAC centres as one of their options in the event of a need to file an accident report. 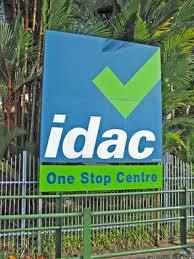 Currently there are 7 IDAC centres spread around Singapore where motorists from the participating insurance companies get other accident related advises and guidance for accident claims. He stayed with me till 6.45pm (beyond his working hour of 6pm) to assist in the assessment and submission. Mr Wong Lip Yong did his work cheerfully and professionally even at 6.45pm. He did not even rush me. Hence my submission at 5.15pm onwards on 21/4/2016. He understood that i was trying my best to submit within 24 hours. Please convey my appreciation to Mr Wong Lip Yong. It is best to contact your insurance company for status of claim and any surveyor report. On 24/3/2018 I had an accident in JB and sent my car to an China Taiping Insurance authorised workshop there. Until now my car still not ready while the defects are actually not that big; the left rear tyre was broken, the rear doors were a little offset and leakage to the gearbox housing. Do these type of damages took nearly 2 months to repair. I’m puzzled. Thank you. China Taiping is not under our accident reporting panel of insurance companies. However due to the complexity of the accident with foreign vehicle & foreign country, it sometime takes a longer time to conclude a claim for repair. However in normal circumstances, we will advise vehicle owners to send their vehicle back to an authorised workshops in Singapore. We also suggest you to contact your insurance company to enquiry about the status. A driver drove a car insured under NTUC Income, had an accident with my car. The driver hit from the rear into my car. I have filed a report, however the driver had not file the accident and not contactable by the driver’s car insurer and me. I have file a 3rd party claim. What can the car’s insurer, my car motor claims assessor or I do? You should file a police report for hit and run accident. If the 3rd party is still in Singapore, the police will likely be able to contact the 3rd party. Hi IDAC, I was travelling on a one-lane, two-way carriageway. There was a car parked by the road, at a single continuous white line, which blocked my way. At the same time, there was a car coming towards me in the opposite direction. In order to stay within my lane, my left side mirror hit the stationary car’s right side mirror. That stationary car driver asked for a compensation, which I paid up. Now, what can I do? My side mirror would not have been damaged if he had not parked anyhow. Moreover, I am upset I have to compensate him since he was in the wrong to park his car at continuous white line. Is it advisable to report insurance company? Otherwise, I have to pay for my own repair, plus the compensation given to him. His mirror only got a small scratch. Pls advise. Thanks. We apologises for the late response as we were experiencing technical issues with our web services. Likely you have resolve your issue. However for knowledge purpose, once you pay for the damages for the other party, it is then not advisable to claim insurance for the damages of your side mirror as it will impact your renewal premium next year. On the 4th July 2018, i had an accident with a taxi driver. I was focusing on the parallel parking, but instead i forward my car accidentally without realizing the taxi in front of me. So i hit the taxi and both of us, the taxi driver stopped. The taxi driver and i decided to settle once and for all. I asked him whether its possible if i were to pay the charges on the spot, but he disagreed. i also offered myself to follow him to the workshop, but he also disagreed. Whatever opinions i provide, he disagree. So I gave up. The accident was just a mild touch, but he reported himself sick the day after. I received the letter on the 20th July 2018. Im trying to help to settle the case, but he is not helping himself by doing this. What should i do? Unfortunately for your case, you will have to refer to your insurer for help. We apologises for the late response as there were technical issues with our web services. Currently we are unable to file an accident report online. However we are working towards a more convenience way for motorist to file report in future. Watch this space for more info soon. I would like to know about ACE autombile appraisal services? I couldn’t find any info online. Sorry, we are unsure about ACE autombile appraisal services. on 21Dec 2018 Friday. The other party has NTUC cooperative motor insurance. My car was rented private hire car with Liberty motor insurance. It was a minor accident with dent & scratches on my car. Now my car rental company wanted me to pay a deposit of 1K to ‘fight the case’. My independant assessment of damage to my car is only abt $200. Should I proceed to pay deposit to car rental coy. I am sorry about your recent mishap. Please read through the rental agreement between you and the rental company to understand if there is a clause of such requirements. Also I do not understand the term ‘fight the case’? Isn’t it the interest of the rental car company to contest any claims against their motor insurance policy? I think if the merit is in favour of you, then both you and the rental car company should join hands to contest the claim. However without knowing the details of this case, the above are solely non my individual opinion. Please further discuss with your lawyers, workshop or insurance agent to understand more of your situation. Thank you for your reply. What are the information you require in order to better answer my inquiry. My question is whether it is normal for the rental company to accept a deposit every time there is a motor accident to settle a insurance claim. If for example the judgement against me falls through then I will have to pay excess otherwise the other party will pay excess or instances where it is 50/50 then both parties will pay excess. Your advice on this greatly appreciated.